The Huffington Post deleted a story asserting former Secretary of State Colin Powell could become the next president from its site Thursday morning, in a decision the writer believes could be the result of a call from President-elect Donald Trump’s friends in high places. “Maybe some of his friends contacted The Huffington Post and said: ‘You gotta bring this down, it’s inciting too much doubt,'” Richard Greene, the contributor who wrote the story, told The Daily Caller News Foundation. Greene lays out a totally unrealistic, if not technically impossible, scenario in his piece in which Powell ends up being the next president rather than Trump. The theory is based on a report from a team of researchers and lawyers that 50 of Trump’s electoral votes could be invalidated because the electors failed to meet legal requirements in their states. If one senator and one representative officially challenge the legitimacy of the electoral college vote, and a congressional review found the challenge valid, Greene asserts, then the House of Representatives would choose the next president. They could choose from the top three electoral vote-getters — Trump, former Democratic nominee Hillary Clinton and Powell. Democrats could choose to back Powell instead of Clinton, hoping some Republicans would join them. And presto! Powell is elected the next president. He acknowledged it’s very unlikely this scenario would play out, but said the voters deserve to know it’s an option they can pursue by contacting their congressmen. The very power of his assertion may have led to its removal, he said. 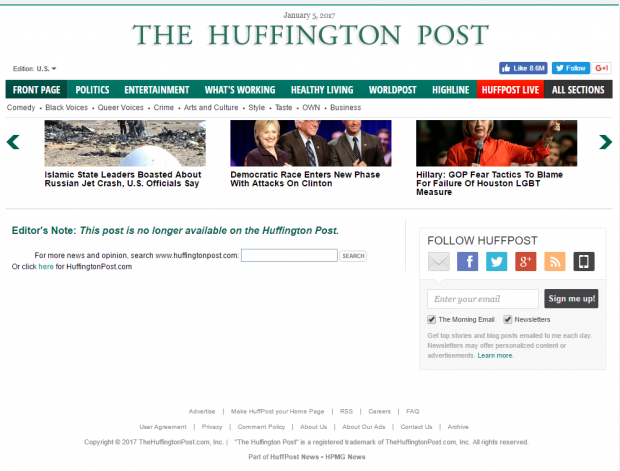 “This post is no longer available on the Huffington Post,” reads the editor’s note that has replaced his story. As an established contributor at HuffPo, Greene said he self-published the post early Thursday. Editors later reviewed the story and took it down from the website. He was not notified or contacted as to why. “When a writer goes to the very core and the heart of the democracy, and challenges the accepted wisdom, I think that media becomes very skittish,” he told TheDCNF. HuffPo could not immediately be reached for comment. The senior politics editor, Sam Stein, replied to a request for comment by notifying TheDCNF he is out of the office on paternity leave. Greene’s now-deleted post is only the latest in a string of HuffPo stories on fantastical ways Trump could still lose the White House. Another recent post wildly asserted a federal judge could actually “install” Clinton in the White House because of Russian meddling in the election. The point seems to be to undermine the results, while simultaneously stoking the irrational hopes of upset Clinton supporters for as long as possible.